Before Calum Ranson starts middle school, he spends a summer helping his mom in the family's bookstore, the Siopa Leabhar. When he's not working, Calum thinks about his missing cousin, Findley, and figures he will be the one to find him. Though the family appear normal to the outside world, they are really part of the Sidhe, a faerie clan. Nobody knows this until Laurel, a new girl in town, shows up at the bookstore wearing necklace which Calum recognizes as a symbol of the dark faerie clan, the Hobayeth. As Calum and his friends drift apart, his friendship with Laurel grows. The must learn to work together in the real world and the Otherworld to rescue her brother who disappeared seven years earlier, around the same time as Findley. Will the attempt free Findley as well or cost him his life? 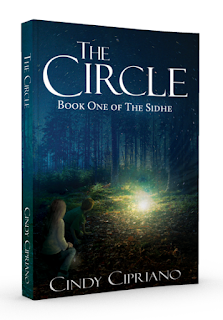 Cipriano's debut novel, The Circle, captivates the the reader with intrigue and mysterious twists. Relatable characters help to make the transition from "real world" to fantasy a smooth one. Though the story sometimes gets bogged down with details that don't have any real bearing on the plot, it does help set the stage for a second novel young fantasy lovers will look forward to. An underlying message of the importance of family ties and friendship help round off the solid fantasy novel. **I received an ARC copy of the book at no charge to facilitate my honest review. No monetary compensation was received. So Your Son Hates to Read?